In this article I show the unbound Scottish patriotism of Robert Burns and argue he would have been a leading voice of the Yes Campaign. Although there will always be those who will toast an anodyne, simplistic Kailyard grass-chewing peasant ‘Burns’ who is an abstract, universal white knight of ‘friendship’ the world o’er, this out-of-context unhistorical ‘Burns’ never did exist. The real poet was a revolutionary republican of nationalist sentiment with passionate egalitarian views; he was anti-war, anti-imperialist, anti-slave, detested corruption in politics with vehement outrage, wished to see the overthrow of the Feudal system and believed in the rights and political suffrage of the common people. Burns was, as Thomas Crawford has shown, the quintessential political poet par excellence. Robert Burns was a man who could have changed the fate of nations, said Dr James Currie, had he been born to a higher social station in life. Burns changed the fate of one nation: Scotland. Against advice from the Edinburgh Literati – who told Burns his fame would be best served by writing exclusively in English – he wrote mainly in the Scots language. I have often said to myself what are the boasted advantages which my country reaps from a certain Union that counterbalance the annihilation of her Independence, and even her very name! It was in satirical reference to Scots aping English habits that he wrote ‘Thou Englishman who never was south the Tweed’. He blasted the Scottish politicians who signed the Treaty of Union in 1707 as a ‘Parcel o rogues in a nation’ who sold out the Independence of the Scottish parliament for ‘English gold’ and took their ‘hireling traitors wages’ from the Union. The poet detested corruption in politics, local and national. Many of his poems reduce the work of senior politicians to the farmyard, where, satirically, he suggests in A Dream the Prime Minister’s cabinet would be better mucking dung in a byre than holding high public office. Pitt’s Tory government were a ‘profligate junto’, a pack of ‘unprincipled miscreants’. He defines politics at Westminster as a process of ‘nefarious cunning and hypocritical pretence’ to govern society ‘for the emolument of ourselves and our adherents’ and damned politicians for ‘that horrid mass of corruption called Politics & State-Craft!’ Whoever sold out the interests of Scotland were to be driven down and destroyed by a ‘rough-shod troop o Hell’ and ground into ‘the mire!!!’. Burns is a shrewd moral idealist who judges the honesty and motives of politicians whatever their apparent party. Scottish politicians who do not serve the people of Scotland first and foremost are, for Burns, traitors to their nation. His patriotism as a Scot is unbound, intensely passionate and by modern standards, highly eccentric. On first crossing the river Tweed into England he shouted back to Scotland the last two verses of The Cottar’s Saturday Night, beginning ‘O Scotia, my dear, my native soil’ in a prayer for Scotland’s future. He admits the story of William Wallace ‘poured a Scottish prejudice into my veins which will boil along there till the flood-gates of life shut in eternal rest…’. He knelt at the tomb of ‘Sir John the Graham, the gallant friend of Wallace’ and said ‘a fervent prayer for Old Caledonia over the hole in a blue whinstone, where Robert the Bruce fixed his loyal standard on the banks of Bannockburn’. His greatest ambition was realised when he was recognised as the Bard of Caledonia. From that day hence, his life’s devotion was to his country as the nation’s bard. Only a patriot of extraordinary talents would have re-written the songs of Scotland, adding his own priceless gems without seeking a black half-penny payment for his work. Who works for Scotland now free of charge? Influenced by the progressive forces of the Enlightenment, the American and French revolutions he believed in the international rising of all common people’s to wash away the Feudal society of pompous rank and title who parasitical lived off the backs of the poor peasantry across the globe. Burns, through his poetry, became the immortal vox populi of the poor, the majority of 18th century Scots. From The Twa Dogs to Epistle to Davie and other works, Burns articulates a language of the voiceless, the common people from whence he sprang. They are his heroes; heroes often afflicted with brutal poverty and oppression but their humanity shines through. His anonymously published radical republican song Is There For Honest Poverty (A Man’s a Man) foresees the demise of the parasitical Feudal order where those at the top did not work and consumed the labour of the poor. The song foresees a world of economic and political equality (still not achieved in Scotland in 2014) where the world of royal pomp, the patronage of title and its concomitant corruption are swept away. The song envisages democratic rights as the antidote to the corruption of bribe-based political patronage, the offer of pretentious title, pomp, post and pension to buy and influence power. Burns supported the pro-democracy group the Scottish Friends of the People, led by the QC Thomas Muir. The song is also anti-royal. Knights and nobles are created from the breath of Kings but honest people who think for themselves are set above such showy title. England’s Hanoverian royal family were a ‘beef-witted insolent race of foreigners’ to Burns who were accidentally thrown up into importance: they were ‘an idiot race to honour lost’ and those who knew them best ‘despise them most’. Patronage is corruption to Burns. Privileged elitist birth is also anathema to his passionate egalitarian views. A fundamental principle for Burns is that all people are born equal. Every Burns supper where a glass is raised for a royal toast are suppers out of kilter with the poet’s views. In the contemporary politics of his day Burns paints a world of corrupt mediocrities devoid of principle with only a few worthy patriots who supported progressive policies. In doing so he sounds contemporary now. Even when he used the pen-name ‘A Briton’ it was employed in reference to a thread of British republicanism now mostly forgotten. 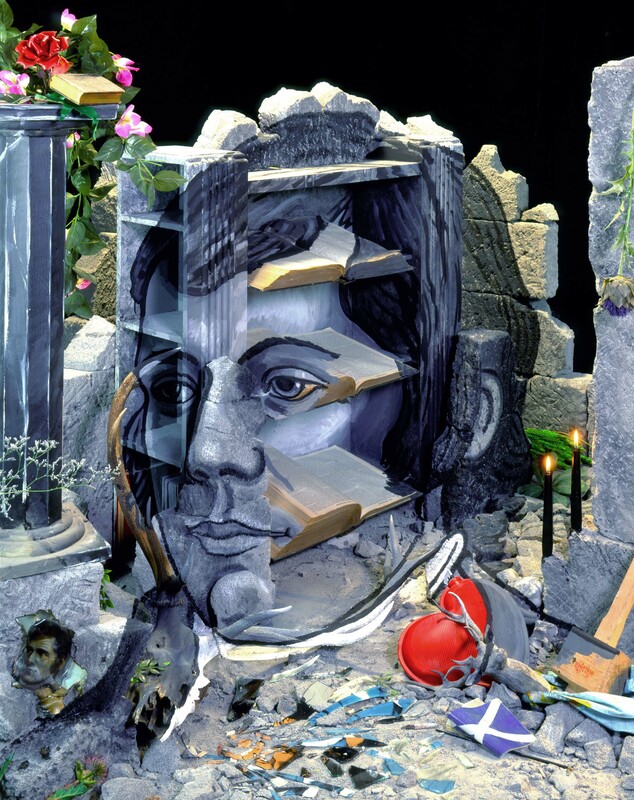 It is in his most powerful patriotic song Bruce’s Address to his Troops at Bannockburn (Scots Wha Hae – a song published anonymously in May 1795) that we see and hear the ‘nationalist’ Burns at his best. If the bard had had the luxury of the vote in his own time to decide whether or not Scotland should regain her Independence, he would have grabbed it with both hands and blasted those who take their wages from Westminster as pusillanimous poodles of post and pension who act to preserve their own status and self importance. For the bard, it was Scottish Independence – all of us first – not for our representatives to sell Scotland’s interests for ambition, in Westminster. Modern Scots have woken up to the fact that Westminster is a limited minimalist parliamentary democracy that does not serve Scotland. The survival of the zombie-like windbag pomp in the House of Lords is a testament to the failure of a Union that served only the titled throng of England and would have left Burns with a longing that Guy Fawkes had succeeded. He might even have wished to update those (never quoted) lines he wrote for an Inscription for an Alter to independence in 1795.
Who was Che Guevara? an incarnation of Burns perhaps! Thanks for that final quotation, have never heard it. Perhaps a subscription can be raised to finally have the Altar built! Well written P. Let’s hope the younger scots who can vote understand the truly monumental help they can provide in writing history this year. They may never get the opportunity again to reshape their homeland. We’ve got to trust in our abilities as a nation and as a leading democratic country. We have the educational system, the resources ( oil, gas, shale, fish and most importantly a fantastic workforce ) within our borders to make Scotland a better place. History beckons. It’s not a leap of faith to vote yes, it is instead the first step in a long journey that will give Scots their pride back. I will vote “YES” without hesitation. I know I’m going to be hounded for this, but what the hell. Burns?! Please. There’s nothing radical about anything he’s written; it’s heavily diluted. And anti-slave? No, probably not. He was about to go to work on a slave plantation. Some will argue that he never DID do this, so he’s off the hook. But the supposed republican and egalitarian bard even CONTEMPLATING such an option demerits any pretension. He was also audibly silent in terms of speaking out against the slave trade. I also have to make this clear: I’m a YES voter. But I’m done with Burns. Well, everything except Merry Muses and Tam o’ Shanter. NordicScotland, come on. ‘.Who wilt not be, nor have a slave’ is a statement against slavery. The song The Slave’s Lament is evidence enough of his anti-slavery. He despised the fact the peasant poor worked to allow the idle rich to eat: the Scottish peasantry were not far from being enslaved themselves….read The Address of Beelzebub and the headnote. Burns’s experience at that critical time when the Armours ripped Jean (his wife as he saw her) and his twins away from him and when there was a writ out for his arrest, is a time when it was either fame or flee, because where did all Scots exile themselves to when they were SHAMED out of Scotland? To the West Indies……Burns dramatizes this with self-pity in his poetry. Does anyone really seriously tell me he wanted to leave Scotland? Come on. This is nothing but a cheap ploy by a couple of anti-Burns academics who want to throw water on the Radical Burns to dilute his forthright views. Not a republican? He loathed the Hanoverian crown….’an insolent beef-witted race of foreigners’ and also ‘An idiot race to honour lost, / Who know them best despise them most’. He shrugged off the whining of his old friend at the killing of the King and Queen of France as a trivial de facto act which mattered little when (Roscoe’s words quoted by Burns) ‘ The welfare of millions is hung in the scale and the balance yet trembles with fate!’ Is there for Honest Poverty is about the end of the Feudal Order; that is the end of title and rank: ie and end to coof-heided LORDS, their POST AND PENSION etc. Is that not a REPUBLICAN song if read literally? Scots will always argue black to white when it comes to Burns. I have even heard the amazing lunacy that Is There For Honest Poverty is a racist song……….what next? Some critics of Burns will never be at peace because they want Walter the Tory Scott to be our national bard. Even james Hogg was a better poet and better novelist than auld Walter. Thanks for your comments, Paddy. I really appreciate it. But I’m still not convinced. 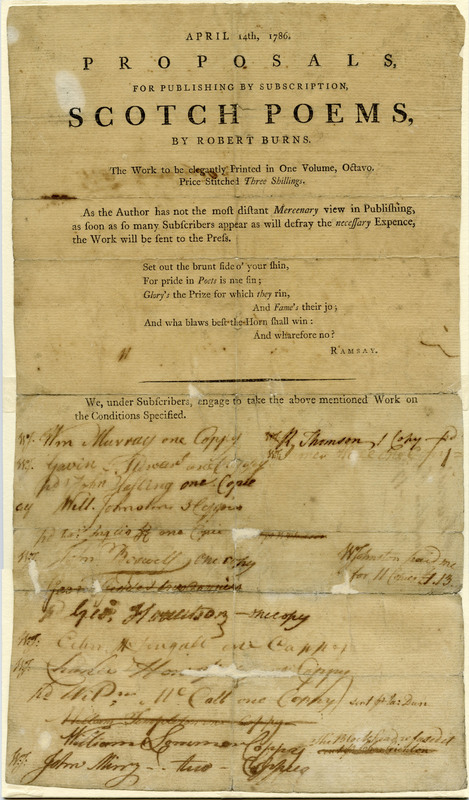 A Slave’s Lament – a pretty awful, isolated song – is hardly evidence of Burns’ supposedly strong anti-slavery sentiments. In comparison to other poets and thinkers of his day, he remains suspiciously silent, given his egalitarian sentiments etc. P.S: I like Scott’s historical romances, but I can’t stand his politics. A humble ploughman who despite all his adverse comments, wasn’t too proud to seek the patronage of the high and the mighty when seeking a job as a gauger in what was essentially the Imperial Civil Service. Nor did his egalitarian instincts prevent him from seeking their influence when seeking promotion, thus giving him the edge over a fellow worker.